Ninety percent of the wines made in Rias Baixas are white and most are produced from the pale green Albariño grape, although 12 different grapes are allowed. Rias Baixas is located on the far northwest Atlantic coast of Spain just north of Portugal. The wines from here generally offer good value for money, are well made and taste delicious. On the eyes, this Albariño is pale gold with deep legs and aromas of lemon zest and white flowers. The palate is muted but dry with good acidity and flavours of lemon grass, white peach, white pepper and brine. WSET Good plus – juicy, great with hors d’oeuvres, seafood salad or oysters. If you can’t find this one at the wine store, try any Albariño – it’s unlikely you’ll be disappointed. Search this site for other versions under ‘what would you like to drink?’ At Marquis Wines in Vancouver, the Bodega Garzon is a great option. 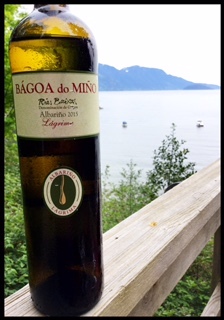 This entry was posted in Albarino / Alvarinho, OTHER, Spain, WHITE and tagged Albarino, Bagoa do Mino, Lagrima, marquis wines, Rias Baixas DO, spain, white wine. Bookmark the permalink.